"Your Link To The West"
Welcome to our Ranch! We are a full service Equine Facility and pride ourselves in helping you reach your goals and dreams. Come along with us for a good time! We will help you find your new equine friend or show companion. We have a fine selection of trail and show horses always available for sale. If we don't have what your looking for let our experience work for you and we will find you that special horse. We also offer winter sleigh rides as well as carriage & wagon rides on our location or will travel to yours! 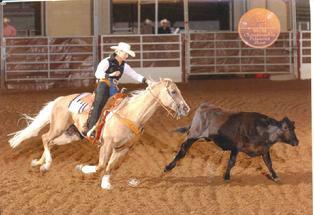 We offer a variety of disciplines including Western, Huntseat, Reining, Halter, Showmanship, Equitation, Horsemanship, Trail, Barrels, Cow Horse, and Roping. Stop by for a visit or give us a call. We would love to hear from you! We are located 3 1/2 miles west of Rhinelander on Hwy K. Which is east of Hwy 51 and west of Hwy 47. We have a heated indoor riding arena and a large outdoor show arena with a two story announcers booth. Our indoor arena barn has a heated wash rack, bathroom, tack room and large meeting room with a beautiful gas fireplace. We have 2 barns for a total of 19 permanent stalls. We also have a trail horse barn with tack room, harness room, tie stalls for 8 horses and 2 additional box stalls. All pastures have automatic waterers and 3 sided shelters. If you are looking for a horse to buy or perhaps want to lease one first. Come and check us out. Always a great selection of Trail and show horses available.